Kiev’s military and self-defense forces in eastern Ukraine have announced they will withdraw heavy weapons from the frontline following Saturday’s exchange of 191 prisoners. This comes as OSCE monitors have visited the devastated city of Debaltsevo. Ukrainian Army and Donbass forces have agreed to remove heavy weapons from the conflict zone, Eduard Basurin, deputy commander of the DPR's Defense Ministry's corps, said on Sunday. “Today we’ve done preparatory work. Tomorrow is a holiday [Defender of the Fatherland Day], and starting from [February] 24 the process of heavy weapons pullout will begin,” Basurin said, as cited by the Donetsk news agency. The process is set to be completed by March 7 under the terms of the truce. 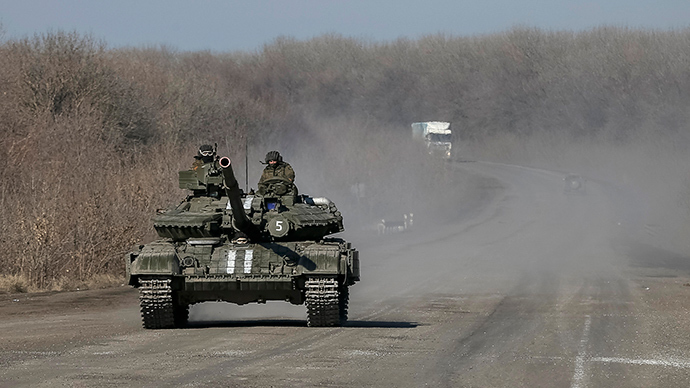 OSCE monitors are now waiting for the documented evidence of the pullout, such as inventory lists, routes and locations of concentration of the weapons. However, they won’t observe the process itself. “A special monitoring mission of the OSCE has been monitoring displacements of the heavy weapons for five months already,” the head of the Ukrainian OSCE mission, Ertugrul Apakan said in a statement. A monitoring mission has visited the city of Debaltsevo in the Donetsk region after the regular army left it. The footage released by the OSCE revealed scenes of devastation in the city, which has been the epicenter of fierce fighting between some 5,000 Kiev troops and militias. The standoff came to an end on February 18 after President Petro Poroshenko announced a troop withdrawal. However, Kiev had been unwilling to acknowledge being surrounded. Rebels and international media later reported the withdrawal resembled disorganized fleeing. Debaltsevo stand-off contributed to the sporadic shelling that has been going on despite the truce, backed by the “Normandy Four”. On February 12, the leaders of Russia, Ukraine, France and Germany rubber-stamped the long awaited peace deal in Minsk. To end the conflict that has already taken some 5,600 lives, according to the latest UN estimates, they introduced measures, such as the ceasefire commenced February 15, a pullout of heavy weapons, and constitutional reform in Ukraine by the end of the year. German Foreign Minister Walter Steinmeier said Sunday that the conflict in eastern Ukraine may be showing signs of de-escalation following the prisoner exchange. “There are early signs that it might at least be some de-escalation. Both sides have finally exchanged prisoners and are apparently willing to begin the withdrawal of heavy weapons, not everywhere, but at key points of the front—it's all part of the Minsk agreements,” he told Germany’s Bild newspaper. He then urged Moscow to exert pressure on the rebel militias to cease all military activity.